As previously mentioned, this is the pre/ post -match watering hole on match days, but considering it was a positively balmy October evening, the cans were out so Slats had to wait until after the game. They reason I’m mentioning this is due to the fact that, seeing as how we’d just beaten world-champs Germany 1-0, there is the distinct possibility that I could have drank from an old-shoe & enjoyed it so take from this report what you will. 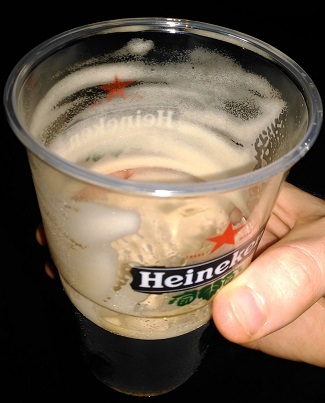 The pints this time round were served in plastic glasses but, as before, this didn’t detract from them in any way. There was a good bit o’the cream, the taste was excellent, very tasty; I really enjoyed the pint. You can see from the pic that the creaminess lasted really well right down the glass, providing a gulpulicious finisher. Was gagging for the next one once the first was polished off. This place is really consistent & serves good Guinness. Another high 3.